M78 is the brightest diffuse reflection nebula in the sky. It has an apparent magnitude of 8.3 and lies at an approximate distance of 1,600 light years from Earth. It has the designation NGC 2068 in the New General Catalogue. Messier 78 occupies an area of 8 by 6 arc minutes, which corresponds to a linear diameter of about 10 light years. 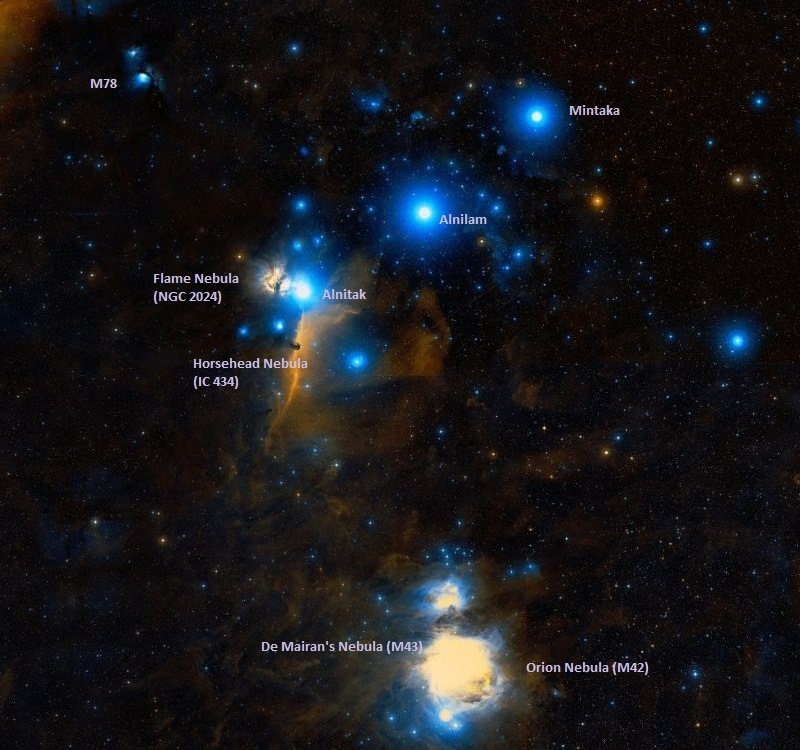 The nebula is pretty easy to find as it is located only about 2 degrees north and 1.5 degrees east of Alnitak, the easternmost star of Orion’s Belt. Alnitak has two other prominent nebulae associated with it: the Horsehead Nebula and the Flame Nebula. M78 is a bit further away from the star than these two. The nebula can easily be seen in large binoculars and small telescopes, which show a hazy, comet-like patch of light with two 10th magnitude stars that illuminate it. M78 is also visible in 10×50 binoculars as a dim patch, but it requires clear, dark skies to be seen. 4-inch telescopes will sometimes reveal the haze around M78 and also show the nearby reflection nebula NGC 2071 under good conditions. 8-inch telescopes begin to show the details of M78. 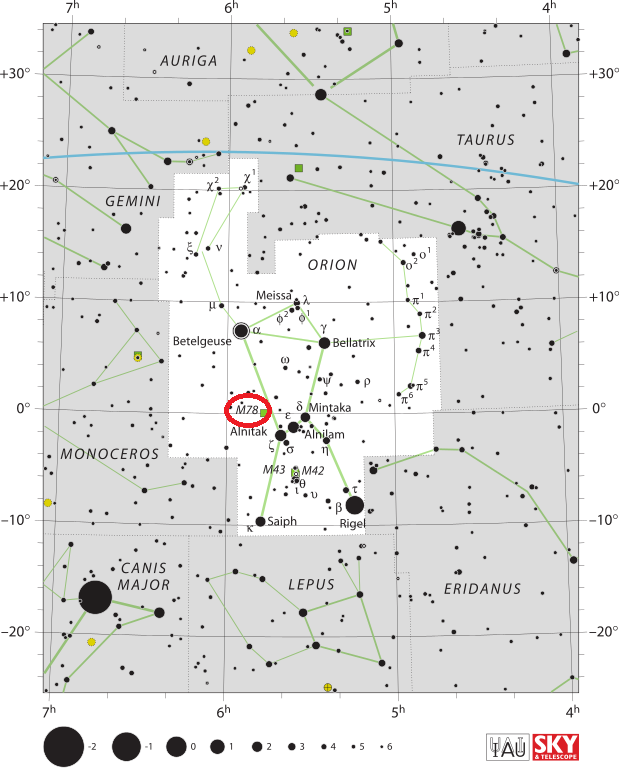 A 9th magnitude open cluster, NGC 2112, can be seen about 1.75 degrees east of the nebula. The cluster lies in the background and is some 2,800 distant. The best time of year to observe M78 is during the winter, when Orion is high in the sky. 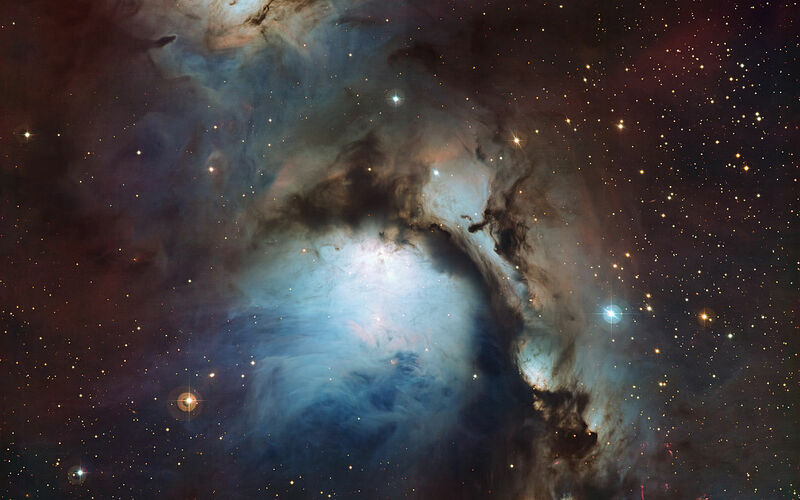 Messier 78 is located in a region of the sky that contains several other nebulae that belong to the Orion Molecular Cloud Complex, including NGC 2064, NGC 2067 and NGC 2071. M78 is the brightest reflection nebula in this group. The Orion Complex itself is hundreds of light years across, spreading from the stars of Orion’s Belt all the way to Orion’s Sword. It is one of the brightest and most active star forming regions visible in the sky and contains several famous nebulae, including the Orion Nebula (M42), De Mairan’s Nebula (M43), the bright emission nebula IC 434, which contains the dark Horsehead Nebula, the emission nebula known as Barnard’s Loop, the Flame Nebula, and the large H II region known as the Angelfish Nebula or Lambda Orionis Ring. Messier 78 is a reflection nebula, which means that it contains very little ionized gas and merely reflects the light of the nearby stars. 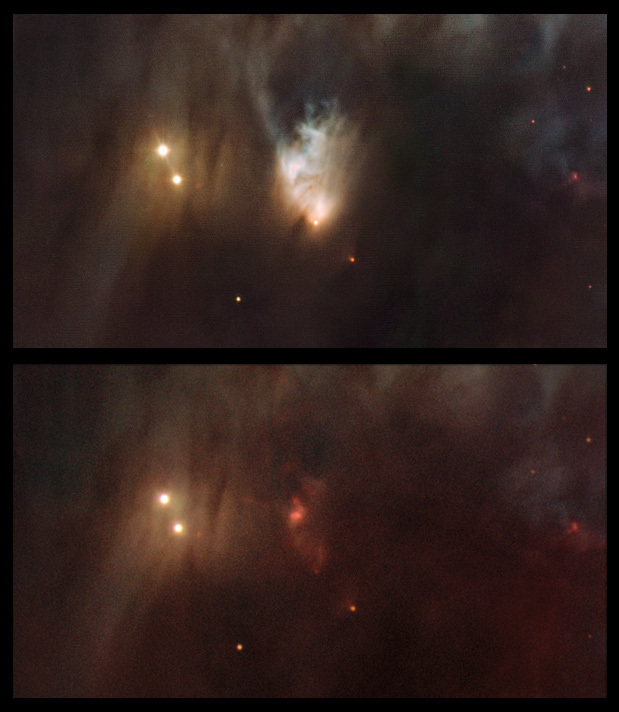 Two early B-type 10th magnitude stars in M78, HD 38563A and HD 38563B, are responsible for illuminating the nebula’s dust clouds. Infrared observations of M78 have revealed that at least 192 stars have formed within the molecular cloud associated with the nebula. The cloud is known as Orion B or LDN 1630. The young stars occupy an area of 7 arc minutes of apparent sky. 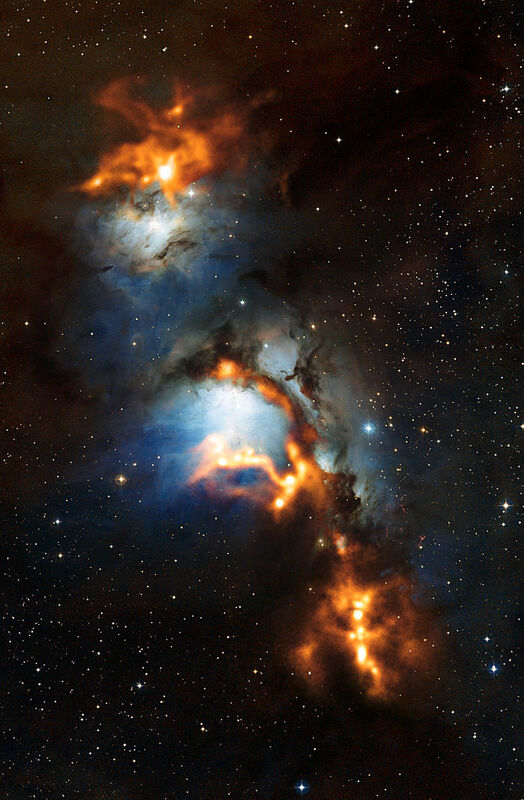 Messier 78 contains about 45 T Tauri variables. These are very young, pre-main sequence stars, typically found near molecular clouds, that are still in the process of contracting to the main sequence. The nebula is also home to about 17 Herbig-Haro objects, small patches of nebulosity that form near young stars when these eject jets of gas which then collide with the nearby dust and gas at high velocities. Herbig-Haro objects are commonly found in star forming regions, with several often forming around a single star. They typically only last for several thousand years before dispersing. Two large stars, well defined, within a nebulous glare of light resembling that in Orion’s sword. There are also three very small stars just visible in the nebulous part which seem to be component particles thereof. I think there is a faint ray near 1/2 deg long towards the east and another towards the south east less extended, but I am not quite so well assured of the reality of these latter phenomena as I could wish, and would rather ascribe them to some deception. At least I shall suspend my judgement till I have seen it again in very fine weather, tho’ the night is far from bad. Looking like a pair of eyeglasses only a rock star would wear, this nebula brings into focus a murky region of star formation. Best known as Messier 78, the two round greenish nebulae are actually cavities carved out of the surrounding dark dust clouds. 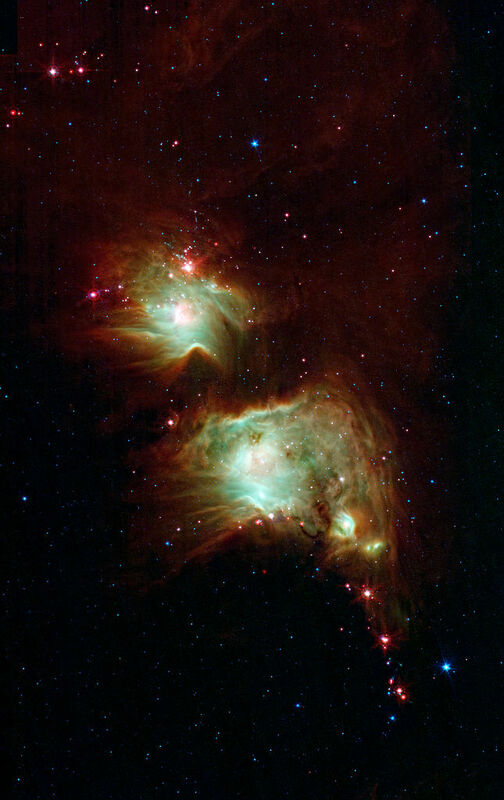 The extended dust is mostly dark, even to Spitzer’s view, but the edges show up in mid-wavelength infrared light as glowing red frames surrounding the bright interiors. The light from young, newborn stars are starting to carve out cavities within the dust, and eventually, this will become a larger nebula. Two stars in a wispy nebula, just above Orion‘s left hip; where a ray from Rigel carried between the centre and last stars of the belt, and extended 2 deg farther, picks it up. A 8 1/2, and B 9 [mag], both white. This object was first fixed by Messier in 1780; and described as “two bright nuclei surrounded by nebulosity.” It is a singular mass of matter trending from a well defined northern disc into the sf [south following, SE] quadrant, where it melts away. The nebula lies equatorially between two small stars, which are nearly equidistant from it, in a blankish part of the heavens; and in its most compressed portion is the wide double star. This was beautifully drawn by H. [John Herschel], and is figure 36 in his Catalogue of 1830. American astronomer Vesto B. Slipher was the first to identify M78 as a reflection nebula after studying its spectrum in 1919. On January 23, 2004 American amateur astronomer Jay McNeil photographed the nebula using a 3-inch refractor and discovered a new bright nebula that had not appeared in images taken before September 2003, with the exception of images taken by amateur astronomer Evered Kreimer in October 1966. The nebula is now called McNeil’s Nebula and is believed to be a highly variable reflection nebula surrounding a young star.